As the new school year approaches at a slightly alarming rate, uniform and backpack-buying duty looms. If your kids’ lunchboxes have seen better days, or you’re giving into their demands for new kit, read on to discover our new-term favourites. These boxes and bags are suitable for pre-school, primary and secondary school students, combine clever, leak-free compartments, wipe-clean interiors and some serious insulation. 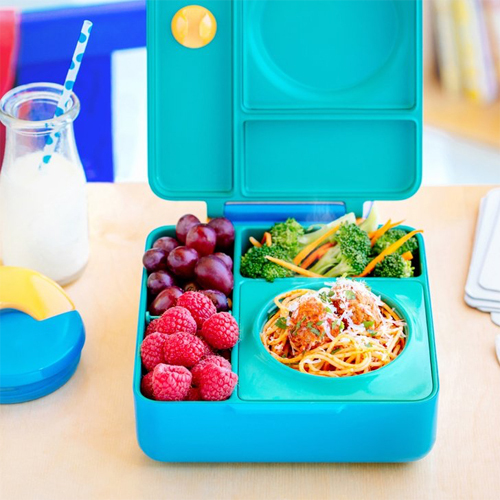 This multi compartmental BPA-free plastic lunch box is simple, durable and comes in a range of bold and bright colours. Split into three compartments, a large section for a sandwich or roll and two smaller compartments for snack or fruit and a 150ml screw top yoghurt pot that fits neatly into one of the smaller compartment, it is sealed tight with sturdy clips. The Polar Gear lunch set comes complete with a spacious 2 compartment cool bag and 650ml tritan bottle. It is great for everyday use at work, school or just out for the day and can be wiped clean easily. This urban style rucksack lunchbag comes complete with a water bottle. The My Little Lunch fun camouflage style lunch bag is fully insulated with an easy wipe, food safe lining, keeping food fresh and cool and has a matching sports bottle. Well worth the price tag! The Playpiece kid’s lunch bag keeps food cool and safe. It’s also ideal for picnics at the park or a day out exploring. Designed with a clip on carry strap that can be easily removed and a carry handle on top, the Playpiece bag has a full zip and comes in a cool helicopter design or funky flower pattern to suit your kid’s tastes. Bring fashion and design to lunchtime with this bright and colourful heart bag from Smash! Smash Insulated Cases are made from durable Polyester with an extra thick foam insulation to keep contents colder longer. Food Safe and BPA, PVC with a lead free lining, the leak proof bottle is also included. Available in pink or black this versatile bento style lunch chiller helps keep your lunch cool and fresh. It comes with a fill at home ice pack and a fork and spoon included, and boasts 3 separate food compartments ideal for storing salads, sandwiches, sushi as well as snacks. The stylish and most compact of all lunchbags, this set includes two lunch boxes of different sizes, one all-purpose tray, two cotton napkins and one cooler bag. It has a wide padded shoulder strap and carrying handle and the case features an aluminium and foam layer for heat insulation. The fabulous Polar Gear Kids 3D Insulated Lunch Bags pack a healthy lunch. The 3D is insulated which will keep their food cool and fresh for longer and food safe, plus it also has a wipe clean PVC free lining, Choose from a colourful Owl, Cupcake or a Football design. We love this pretty Disney Frozen lunch bag. With glitter detailing, a zip fastening all the way around and 2 grab handles, your little girl’s friends could mistake it for a super trendy handbag. Currently when you buy one item at Claire’s you’ll get a second free. Entice your active little boy to sit still long enough to eat lunch with this 3D insulated lunch bag that feature’s Paw Patrol’s Chase. It’s a must-have for Paw Patrol fans. The Slimline Quaddie is part of the Sistema Lunch range and has been specifically designed for packed lunches – ideal for school, picnics and days out. There is a large lower section for sandwiches and other lunch items. In addition there are two smaller sections in the top for snacks and smaller items of fruit. A further top section contains a small water bottle.